The Symphony #3 in E minor by James Domine is a judiciously analytical compendium of performance practices associated with American popular music. For that reason the piece is subtitled “Made in America.” The composer employs a spectrum of melodic modes and characteristic rhythms that together comprise a unique musical statement that is uncharacteristically at home in both the symphonic and popular music worlds. Sketches for the symphony were originally intended to serve as the basis for a concerto that would feature the San Fernando Valley Symphony Orchestra in a live concert with the vintage rock band, Vanilla Fudge. This concert eventually materialized in a live performance and is evidenced in the DVD recording currently available as “When Worlds Collide.” Paucity of rehearsal time however prohibited the full execution of a new piece and what remained of the concerto project eventually found its way into the Symphony #3. Along with echoes of the Vanilla Fudge, the astute listener will also hear ephemeral paraphrases of other rock bands of the period, as well as symphonic allusions to music by Handel, Beethoven, Schumann, Mendelssohn and Ravel. This symphony represents a complex confluence of quintessentially classical compositional styles that combine to form a unique orchestral tapestry steeped in idiomatic American pop music techniques. The first movement, “Radio Waves” is cast in the traditional sonata form. The principal theme is first stated in the trombones framed by a fanfare that sets the tone for the movement. The tempo is marked “Allegro assai” and the attitude is that of a song heard on AM radio. The contrastingly mellow second theme is played by the cellos supported by the woodwinds, pizzicato strings and the harp, creating an atmosphere reminiscent of a Motown hit. The codetta is set to a hard rock beat that increases in orchestral density until it ultimately reaches a dramatic point of no return in repeated dissonant clashing chords of conflict. The development section juxtaposes the two main themes in a dialogue that evolves through eight entangled sequential episodes winding in the fullness of time to the recapitulation. The first theme returns not as originally stated in the exposition, but rather twice as fast in diminution played by the first violins doubled by the clarinet. The second theme emerges in the tonic key played by the cellos and in the second strain is taken up by the violins. The rock ‘n’roll rhythm of the coda compels the movement to its inexorable conclusion. The “Anthem” is a series of nine variations on the Gospel tune “People Get Ready.” The successive variations are framed by an introduction and three interludes that function as ritornelli and a coda that completes the setting. After the introduction, the theme is stated in a stripped-down straightforward mono-linear way by the cellos and basses, then by the English horn and violas accompanied by two bassoons. This is followed by a quasi-improvised woodwind section with the strings providing harmonic support. The trombones and timpani follow with an interlude that leads to a simple harmonization of the melody in the strings. A transitional interlude based on the introduction forms a bridge to the full orchestra playing the theme set in the style of Beethoven’s “Ode to Joy.” Another transitional episode ensues followed by a quartet of two clarinets and two bassoons that play the theme accompanied by an obbligato filigree of violins. Two triumphant variations characterized by canonic imitation in the upper and lower strings are set apart by a contrastingly pastoral rendition of the tune in the woodwinds. In the coda, the melodic line is gently lifted upward by harmonic degrees higher and higher as the Anthem, like the conclusion to a prayer, ascends to the celestial realms. 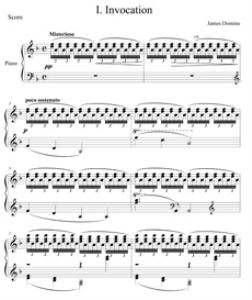 The third movement entitled “Games” is a scherzo cast in a double- binary form that resembles the traditional minuet and trio structural arrangement commonly associated with symphonic third movements. The first theme is characterized by a syncopated melody that begins inauspiciously at first at a soft dynamic level, harmonized by a progression that ascends in stepwise motion, never actually pausing for a cadence but continues relentlessly as the listeners’ sense of tonality is temporarily suspended, allowing a seemingly infinite expansion of harmonic possibilities. This opening theme leads on and upwards until it is counter-balanced in the second strain by an alternating rhythmic figure that represents a dramatic conflict between the various instrumental groups, this conflict comprising the motivation for the second theme. These two introductory parts of the scherzo section are repeated, followed by a secondary set of bipartite matching themes. The first of these is a quasi-developmental phase of the rhythmic idea heard in the first strain and the second is a reprise of the Motown melody from the first movement, this time played as a trombone solo echoed by the bassoon and cellos. This reprise adds an equilibrium of cyclical balance that unifies the entire work as an integrated whole. The opening section of the scherzo concludes with a closing theme that rounds out the passage, leading both back to the beginning and forward to the ensuing trio section. The fourth movement of the symphony is intended to embody a musically patriotic sense of national unity in the face of adversity. Entitled “A Call to Arms,” the movement is cast in an extended sonata form that begins with a martial rhythmic motive in the woodwinds that acts as an alarm, awakening a fanfare of trumpets sounding a call to action answered by an onslaught of sixteenth notes in the strings that further ignite a sense of impending conflict. This opening fanfare leads directly to a contrastingly quiet episode that seems to pose a question as it comes to rest. The exposition concludes with a bi-partite codetta that is first reminiscent of a Sousa march complete with piccolo obbligato, culminating in a great orchestral crescendo based on the opening theme of the first movement.